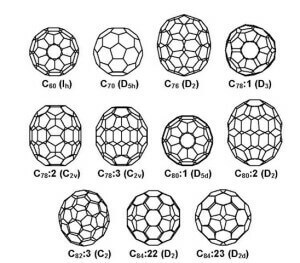 Fullerenes are made of pure carbon atoms, arranged in a lattice that can either form a ball or sphere shape and are typically 1nm diameter. Their number denotes the amount of carbon atoms in their structure. 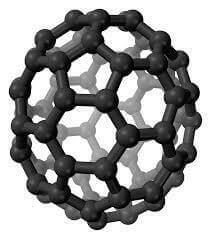 C60, has 60 carbon atoms arranged like a soccer ball. 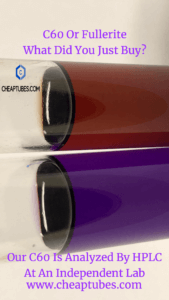 Cheap Tubes supplies C60 in 99.5%, & 99.9%+ solvent free as well as C70. We plan to have C60 99.99% in the coming months. Surface modified C60 and C70 are available upon request. Contact us today to discuss your C60 needs! Large volume discounts are available! For more information about our C60 for Lipid Oils, see below! 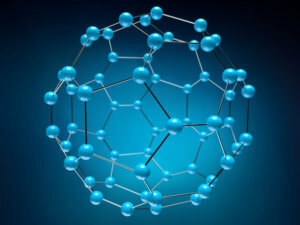 Fullerenes are named after structure they resemble which was developed by renowned architect Buckminster Fuller. 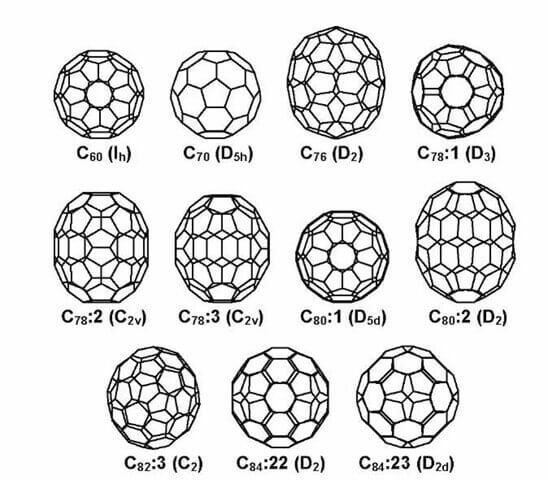 Twenty-five years after their discovery, fullerenes have provided abundant research opportunities in pure chemistry, materials science, biotechnology, anti-aging, pharmaceutical chemistry, and nanotechnology. Their structure is composed of 5 member carbon atom rings separated by 6 member carbon atoms rings. One application that has exploded in the past year is the C60 Lipid Oil market. People shake or mix C60 into olive, avocado, coconut, blackseed, CBD, or MCT oils. 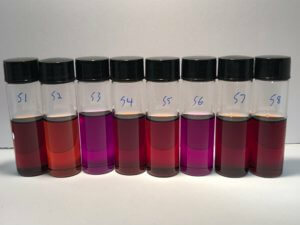 The maximum amount of C60 you can put into an oil is 0.8 grams per liter. Ultra high purity C60 (99.99% and solvent free) is slowly shaken or mixed into the desired oil. C60 is photosensitive and we recommend keeping it out of direct light. Why Do People Consume C60 Lipid Oils? C60 is 172 times more effective against oxidative radicals than Vitamin C! 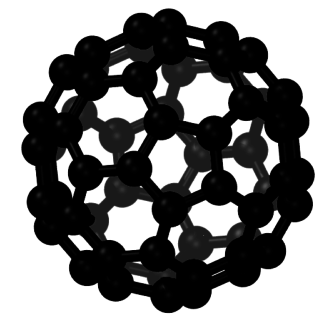 C60 fullerenes have many amazing biologically enhancing properties. C60 has a positive electrical charge which attracts negatively charged oxidative free-radicals and neutralizes them. The C60 molecules are absorbed through the skin or taken internally for research purposes only, can help neutralize large numbers oxidizing free-radicals every second. This occurs without the C60 molecule being changed or losing reductive potency. C60 is small enough to get into the cell mitochondria (the dirtiest part of the cell) and clean out the free radicals. When the cells of the body are relieved of an existing free-radical oxidative burden, they can once again function at natural peak efficiency. Increasing energy, performance and virility. We’re professional nanomaterials suppliers since 2005. The recent C60 shortage has led to many companies springing up to fill the need who don’t know what they are doing. We undertook and experiment. We ordered 8 samples of C60 from China, all were either 99.5% or 99.9% purity. Turns out only 2 were high purity C60, the rest were fullerite. See for yourself with our samples 1-8 below. Laboratory studies on animals found C60 increased rodent lifespans by between 35% to 100%. 1,2 See links below for the science papers. Learning speed and memory were increased significantly. 2 Age related cognitive decline and tumors were completely prevented. 1,2 Potential negative effects of environmental toxins and radiation were eliminated. 1,2&3 Test animals on C60 lived long, vigorous and health lives. C60 does not exhibit toxicity at even absurdly high doses and is very safe. 4 Telomere length is directly related to lifespan. Telomeres wrap the ends of the chromosomes and keep them stable. Oxidative stress has been found through scientific research to be a significant cause of telomere shortening, the main cause of aging. C60 reduces oxidative radicals. A reduction in oxidative radicals may be responsible for the significantly increased lifespans and vigor found in these peer reviewed scientific studies. The same oils can also be used as topical skin creams and ointments for a variety of conditions.When C60 in a lipid oil is rubbed on the skin, wrinkles can be reduced. Your skin feels softer and more supple. Age spots begin to fade away. Wounds and sores heal faster. This leads to a much more youthful appearance. Disclaimer:These statements have not been evaluated by the Food and Drug Administration. These products are not intended to diagnose, treat, cure or prevent any disease, nor make or imply any health claims.